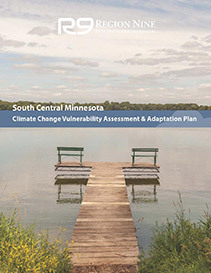 With support from the Minnesota Pollution Control Agency, Region Nine has created a Climate Change Vulnerability Assessment and Adaptation Plan to assess South Central Minnesota’s vulnerability to climate change and create strategies for the region to adapt to climate change. Region Nine, working in tandem with a Climate Change Adaptation Task Force, identified eight top priority sectors to prioritize the planning process: agriculture, water, human health, energy, transportation, forests, ecosystems, and business and economy. The result of the planning process was real, actionable strategies that can be used as a guide to initiate discussions and begin a planning process in Region Nine communities. 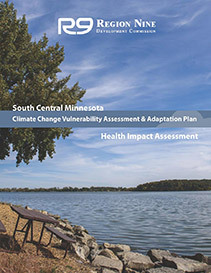 Region Nine also received a grant from the Minnesota Department of Health to conduct a rapid Health Impact Assessment (HIA) on the Region Nine Climate Change Adaptation Plan strategies. The HIA was completed in conjunction with the development of the adaptation plan, with the goal of ensuring that the strategies developed would be health-focused before implementation. By conducting the HIA during the Climate Change Adaptation Plan’s development, greater efficiencies were created in terms of addressing strategy-specific health-related issues that could be avoided at the start, rather than discovering them after the strategies had already been implemented.